Did Qualcomm really expect Apple to never retaliate? "Let me get this straight. You think that your client, one of the wealthiest, most powerful men in the world, is secretly a vigilante who spends his nights beating criminals to a pulp with his bare hands. And your plan is to blackmail this person?" In Christopher Nolan's The Dark Knight (2008), an accountant discovers Batman's true identity by uncovering some accounting irregularities at Wayne Enterprises, but imaginary CEO Lucius Fox quickly puts an end to the blackmailer's plan by pointing out how absurd it is. Qualcomm (NASDAQ:QCOM) may not have been blackmailing Apple (NASDAQ:AAPL) all these years, but Apple thinks Qualcomm is guilty of a similar crime: extortion. In its U.S. lawsuit filed last week, Apple alleges that Qualcomm "attempted to extort Apple" into changing how it responded to a regulatory antitrust investigation in South Korea. The iPhone maker also argues that it has been paying "extortion-level royalties" for years, due to Qualcomm's "no license, no chips" policy where Qualcomm would only sell chips to customers that agreed to onerous licensing terms. It seems as if Qualcomm has been getting away with this for years, which is why its market power has grown so dramatically as rivals fell by the wayside and exited the baseband processor market. Most customers lack the operating scale, legal resources, and financial incentive to effectively stand up to Qualcomm through protracted litigation. Apple doesn't. So let me get this straight, Qualcomm: You think that your biggest customer, one of the wealthiest, most powerful corporations in the world that also has a reputation for squeezing its suppliers would quietly accept your oppressive contract terms and never fight back. And your plan is to extort this company? 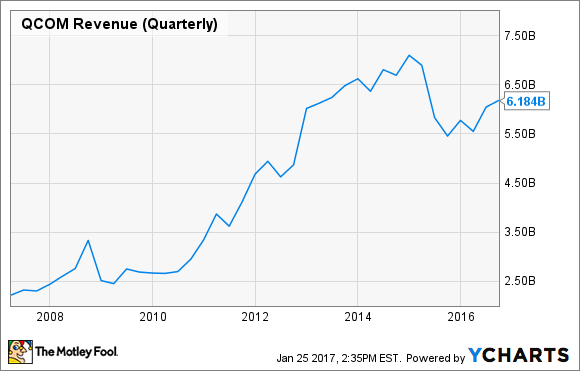 In no uncertain terms, it worked for many years, and Qualcomm's revenue skyrocketed over the past decade. QCOM Revenue (Quarterly) data by YCharts. Broader smartphone adoption was the main factor, but the iPhone pulled an awful lot of that weight, too -- both directly and indirectly (Android was created largely in response to the iPhone). More specifically, from 2011 to late 2016, Qualcomm had extracted both exclusivity in supplying Apple with cellular baseband modems as well as its silence. You may note in the chart above how much sales increased during this time period. Apple was restricted from actively complaining to law enforcement and regulators, although it was allowed to respond if asked. So long as Qualcomm maintained its lock on baseband chipsets, it had incredible leverage and there wasn't a whole lot Apple could do. Enter Intel (NASDAQ:INTC). Intel had been trying to crack the baseband market for years with little to no success. Even today, Intel's modems are technologically inferior to Qualcomm's, but they're good enough and much cheaper, and Intel expects to catch up within a few generations. The combination of Qualcomm's exclusivity ending combined with Intel's ability to supply a sufficiently competitive modem is the perfect storm for Apple to unleash its pent-up discontent in court. The $1 billion that Qualcomm is withholding was just the final straw. Now that Apple has a path to an alternative supplier (even though the majority of its basebands still come from Qualcomm) and is no longer contractually obligated to keep quiet, Apple is bringing a brutal suit against Qualcomm that threatens Qualcomm's very business model. You know it's serious when Apple is litigating, given CEO Tim Cook's hatred of litigation. Did Qualcomm really think that Apple would never retaliate? The moral of the story: Don't extort Apple, and don't blackmail Batman.